Cate Carlton has died, but she hasn't moved on. She finds herself stranded in an in-between space, watching her family go on without her, unable to communicate with them or move on. She also can't remember how she died. In the tradition of Alice Sebold's The Lovely Bones, Eliza Henry-Jones' debut novel is a brave interrogation of love, loss and family, told from the point of view of a departing loved one. It is a book that will make you laugh, cry and want to hug the pages. It is my favourite book of the year so far. The novel is told from Cate's point of view as she watches her family in the aftermath of her own death. Her daughter, Jessa, is thirteen and heading for a tumultuous ride of hormones and first love without the guidance of her mother. Raised on a horse farm, Jessa takes after her mother both in her skill on horseback and in her determination and stubbornness. It is Jessa who goes out on the bush track again and again, searching for her mother's prized horse, Opal, who has bolted. Meanwhile, Bass (Sebastian), Cate's husband is floundering. The children are eating whatever they want and the housework isn't being done. Bass is stuck in suspended animation. It is only Cate's friend and the family's neighbour, Laura who gets things done, coming by to help with the horses and dish out tough love to Bass and the kids. 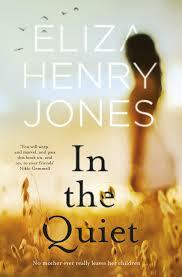 She brings with her a nephew, Henry, whose mother is so drug-dependent that she can't always be there for Henry. Henry approaches Jessa as he would a skittish horse, gently and calmly so as not to spook her away. Then there are the twins, Cameron and Rafferty. They've almost finished high school and must face what's next. Cameron is anxious and sensitive, while Raff seems intent on messing up, yet is the most capable in the face of what has happened. The boys are so similar they even manage to fall for the same girl. Finally, there is Bea-- Cate's sister-- who wants so desperately to be some part of a replacement for Cate, but is her own worst enemy. Will this family (unconventional as it may be) manage to heal each other? Told in scenes which move back and forth in time, this novel is full of atmosphere. By page ten I was in tears, and I didn't think I could handle the rest on a bad week, but something about the voice of the novel was impossible to keep away from. While the themes of the novel are incredibly moving and at times upsetting, this was a strangely comforting book. I felt the power of Cate's love for her children and family as if she were with me, telling me her story. The sense of place in the novel was also a highlight, as the setting of the horse farm was rich and detailed with all five senses working in accord to create a picture. This book presented a familiar yet often overlooked portrait of life for an average Australian family, and their response to tragedy as well as the irony of our being able to hear the thoughts of their mother when they could not, made for a heart-wrenching read. I don't think I have ever read anything quite like this and I gave it five stars.